A new development in the area of flow-induced crystallization is the discovery of "dormant" nuclei. Back when I was last in the field, the thought was that the development of a stable crystallization nuclei was a balancing act between the surface energy of the crystal and the Gibbs energy released during crystallization. 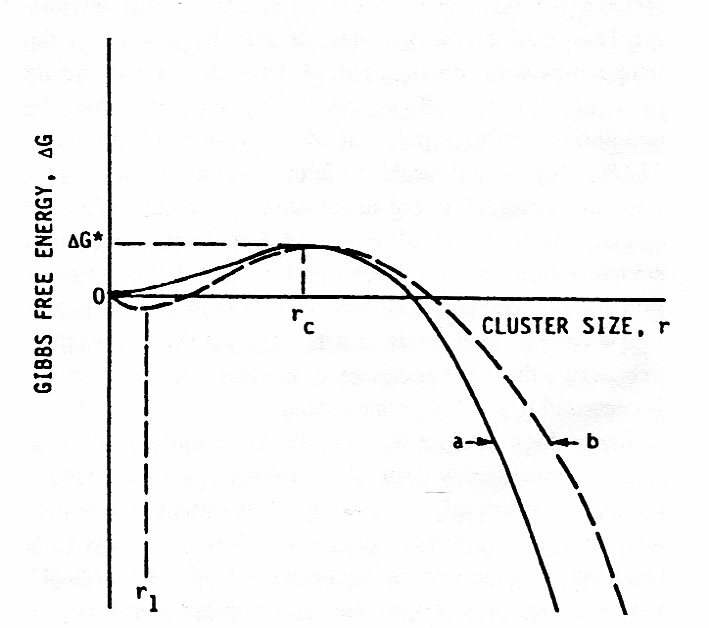 As a nuclei first forms, the surface area is relatively large and so the surface energy required to grow it initially works against the effort, even though Gibbs energy favored crystallization. After reaching a certain size however, the energetics for growth became more favorable and it proceeded without further problems. The figure below shows this with the solid curve. 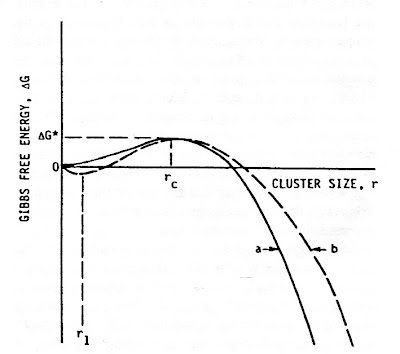 Initially the slope of the thermodynamics (DDG/size) is against growth until the nucleus reaches the size rc, after which the slope become favorable. Unhindered growth only occurs after the curve drops below DG = 0. You can also see on the figure the new understanding which follows the dashed line. In the past, surface energy was taken as a constant and so the solid line was the result. Surface energy is now understood to be somewhat variable, thereby creating the situation shown with the dashed line. Very, very small nuclei of size r1 are actually stable. These form quickly and easily underflow and stay there until the thermodynamics are favorable to grow, i.e., they are dormant. Despite all these theoretical machinations, you can probably see that this phenomenon can impact real world problems. Just about all industrial polymer processes have some sort of shear and/or extensional flow and so all this unusual crystallization is out there lurking. Since the end product is crystallized, it's not like things will look different, but the potential still exists particularly if your temperatures are not very hot. So with that, I'm going to wrap of this series of posts. There certainly is more information in the article, but I'll leave that for another time if it is relevant. My point here is that even in a relatively staid field like polymer science, (minor) revolutions in theoretical understanding can easily occur - especially when you disappear from the field (ala Rip van Winkle) for 20 years.